The Astor Memorial Doors at Trinity Church were commissioned at the bequest of William Waldorf Astor in 1891 and completed by 1896. A memorial to William's father, John Jacob Astor, the portal was designed by Richard Morris Hunt. Karl Bitter was selected in a competition to sculpt the doors at the front entrance, with runners up Charles Henry Niehaus and John Massey Rhind commissioned to sculpt the north and south doors. 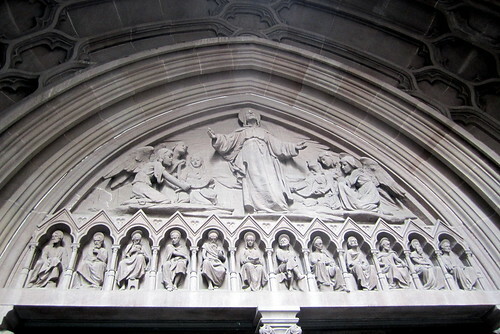 The fourteen-foot bronze doors at the front entrance, completed in 1894, are topped by a 4-foot tympanum with Christ rising above his twelve apostles. 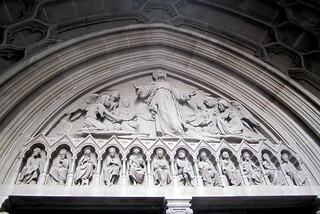 The doors feature six demi-relief panels, each illustrating Biblical scenes: Expulsion from Paradise, Jacob's Dream, The Empty Sepulchre, The Annunciation, The Worship of the Church in Glory, and The Triumph of Divine. Recumbent figures border the panels and are allegorical depictions representing; Morality, Sin, Time, Tradition, Eternity, and Divine Justice. Trinity Church, prominently located at the terminus of Wall Street at 79 Broadway, is the oldest Episcopal church in New York City, having been consecrated on Ascension Day May 1, 1846. Designed by architect Richard Upjohn, Trinity is considered a classic example of Gothic Revival architecture. At the time of its completion, the 281-foot spire was the highest point in New York until being surpassed in 1890 by the New York World Building. The Trinity Church parish received its initial charter from King William III of England in 1697. The first Trinity Church building, a modest rectangular structure with a gambrel roof and small porch was constructed in 1698. The building was destroyed in the Great New York City Fire of 1776, in the early days of the military occupation by the British during the American Revolutionary War. Construction on the second building began in 1788, which was consecrated in 1790 and then torn down after being weakened by severe snows during the winter of 1838–39. By the early 1840's, the church's expanding parish had split. The newly formed parish would build Grace Church, to the north on Broadway at 10th street, while the original parish would re-build the Trinity that stands today. Upjohn designed the new Church in Neo-Gothic fashion, complete with sandstone and stained-glass windows--two features unheard of at the time. Adorned with Gothic spires and pointed arches, and sporting a very linear upward-appearing exterior, the design reflected "High Church" fashion, at odds with contemporary Protestant "Low Church" thought. As a compromise, the side walls were kept simple, without the flying buttresses predominant in most Gothic structures. The adjoining Trinity Churchyard Cemetery, opened in 1697, is one of three separate burial grounds that make up the non-denominational Trinity Church Cemetery (the others being the Churchyard of St. Paul's Chapel and the Trinity Church Cemetery and Mausoleum at the Chapel of Intercession). Among the 1,186 interred here are Alexander Hamilton, William Bradford, Robert Fulton (memorial tribute), Captain James Lawrence, Horatio Gates, and Albert Gallatin. There are also memorials to the unknown martyrs of the Revolution buried on the grounds, 16 officers of the Continental Army and Navy buried in the church cemeteries, and to the thousands of Americans who died in prison ships in New York Harbor. Trinity Church and Graveyard was designated a landmark by the New York Landmarks Preservation Commission in 1966.